Orc's is an anthology of Bodyguard of Lightning, Legion of Thunder and Warriors of the Tempest, 3 novels in the fantasy series Orcs, written by Stan Nicholls. In the world of Maras-Dantia the elder races lived along with each other, while not in peace at least in some tolerance of one another. From Orcs to Elves, Trolls to Kobolds, each race had some of connection to nature in the form of innate magic. The arrival of the human race shattered this fragile balance, with the humans need to dominate and control nature along with their contempt for others unlike themselves and religious intolerance for any belief other than their own. Ripping natures resources from the ground and damming rivers have all contributed to the destruction of Mara-Dantia, bleeding the magical energies the elder races have relied upon for centuries. The situation has deteriorated to the point that the weather and seasons have become affected with a mini ice age causing an ice sheet to encroach from the north. War follows between the elder races and two distinct groups of human, the Mani and the Uni. The Mani are more tolerant towards the elder races and far more in tune with the needs of the Mara-Dantia and as such they are known to fight alongside some of the elder races and always fight against the Uni. Orcs can be seen where fighting is the fiercest, bred for war many live their whole lives in war bands moving from one battle to the next. Stryke is a leader of an Orc war band the Wolverines, more intelligent than most of his kind, he has turned this Orc group into one of the most elite fighting forces on the planet. When they are sent on a simple mission to retrieve an object for their rather sadistic Queen things take a serious turn for the worse and they soon find themselves hunted by both Uni's and their own kin. Orc's is a high fantasy book that introduces us to a very different side to the Orc, set as the main protagonists these green skinned creatures are quite far removed from what we would traditionally see as an atypical Orc. These Orcs are smart, emotional and articulate with a strong sense of humor albeit with a natural ferocity and warlike nature. The plot itself is fairly standard fantasy fare and you could almost be forgiven for thinking you are reading a Warhammer novel as the style and setting are very similar. What makes this different isn't so much the attempt to view the world through the eyes of Orc's but more way the world and creatures within are portrayed. and there is a general tongue in cheek humor running throughout the novel, which does make it a bit more refreshing than it otherwise would be. This extends to the scenes of torture that the Orc's Queen Jennesta delights in inflicting. While on this note there is a casual use of bad language and a few scenes of a SMS nature so not one for the younger reader maybe. If you are looking for a novel that introduces a very different viewpoint in seeing the world through the Orc's eyes (as this novel may suggest) then you are going to be disappointed, the "Orc's" could really be any race, or even a tribe of humans they way they are portrayed and are merely a vehicle to highlight the human's habit of ecological destruction and intolerance to views and beliefs other than their own. There isn't really any sense of a vastly different culture except for the odd reference to their "warlike nature". If however you are looking for an uncomplicated story that manages to not take itself too seriously but manages to convey it's messages very clearly then you will enjoy this book. 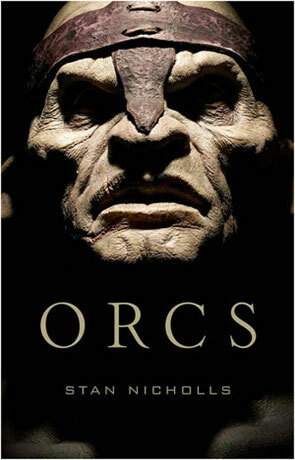 Orc's is a very well written piece of fiction, fast paced and ultimately enjoyable just not for the reasons you might expect. My advice is to pick up the anthology addition rather than the separate Bodyguard of Lightning, Legion of Thunder and Warriors of the Tempest novels as you also get a nice short story at the end. Written on 4th March 2010 by Ant.